Advanced Recent Access is designed to see more properties of your recent used resources (files and directories). Advanced Recent Access is a simple and intuitive software utility, designed to help users by providing them with means of opening recently accessed files easily. Instead of looking for those files all over your PC, you can simply access the files and perform different operations from within this application. It lets you see and open your recent used resources quickly. The installer comes packed in a zip file, and the size is ~661KB. The installation process is simple and straightforward, taking no time at all to complete. Launching the application for the first time, you can easily activate and register the application using the registration code for the application. Once done, you can start using the application to use it features and access you recent files and directories with ease. The UI of the application is simple and clean, and should not be a problem for any type of users, even the novices. At the top is the toolbar with buttons to a few important functions like, Open/Run, open location, Properties, Delete, Search, Help, Languages, and License. Under it are check boxes, these are actually filters that you can apply on the recently accessed items list. There are filters like Directories, Documents, Pictures, Videos, and more. There is also a check box to make the application start when the PC boots. Rest of the area is for viewing the recently accessed items. 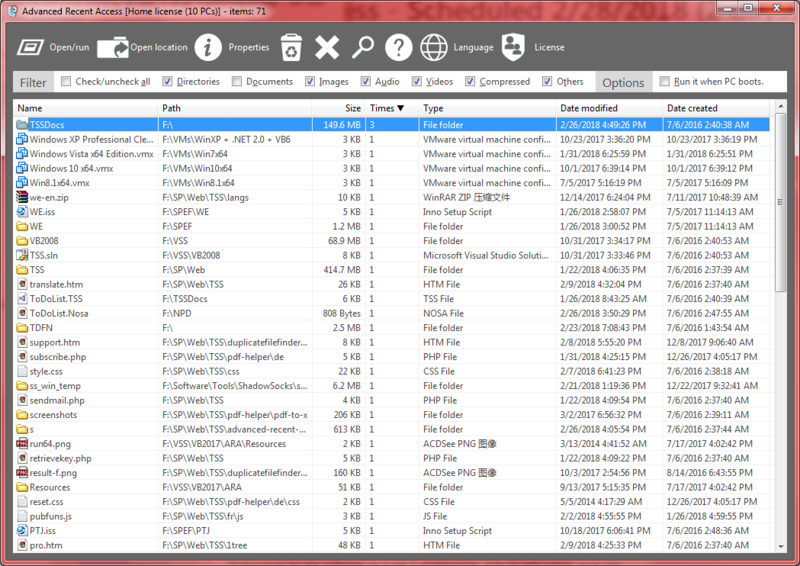 The list displays several details about files, like their name, size, path, format, date modified/created, and others. You can select an item from list and open it or perform a function on it using the toolbar buttons, or you can right-click on the item and choose from the context menu. Search function can be used to quickly get to the desired files if the list is too long. – Simple and straightforward UI with no complexity at all. – Automatically deletes non-existent resources from the list. – Automatically records number of time the file or directory has been accessed. – Filters recent resources list by Types, Path, Size, and more. – Shows Name, Path, Size Type and Date Modified/Created. – Find tool to quickly search for the required files. – Lets you open/run, open location, view properties, and delete the files/directories. – Language of the UI can be changed to the ones available. – No option to clear recently accessed resources list. Advanced Recent Access is a small yet very useful application, that can come in handy on daily basis. It keeps track of all your recent files, enabling you to launch them with just a click, thus saving you valuable time and effort. The application runs smoothly, without any lag or errors. It is definitely worth-trying.